Escape to a warmer climate and enjoy a mini-vacation from Chicago winters in the Greenhouses at the Chicago Botanic Garden. 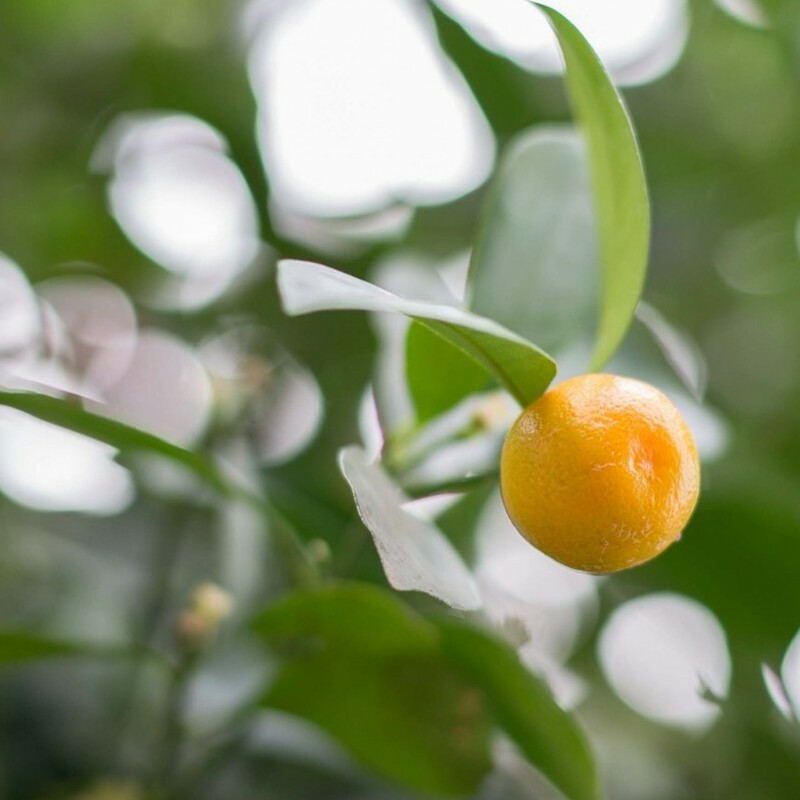 Boyce Tankersley, director of living plant documentation, showed us some of the more unusual plants we will find flowering—or fruiting—in the Greenhouses in January. 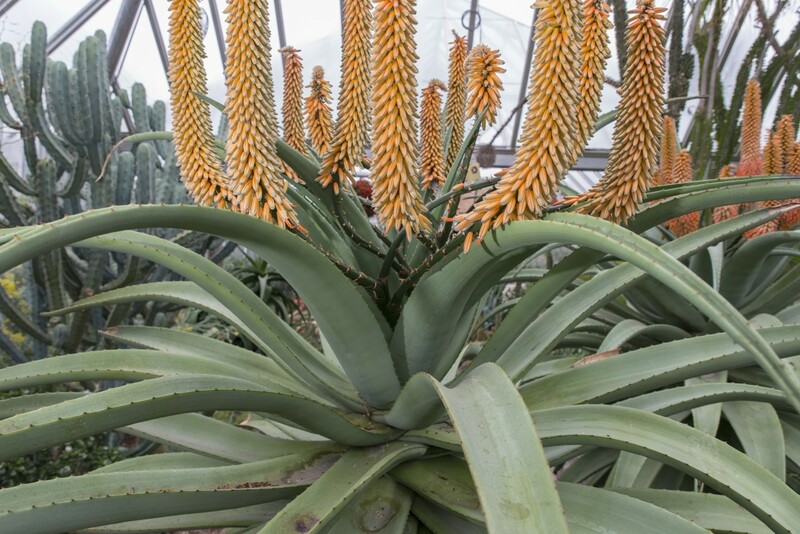 We have 43 different species of aloes, including: dwala aloe (Aloe chabaudii), hidden foot aloe (Aloe cryptopoda), and bitter aloe (Aloe ferox). 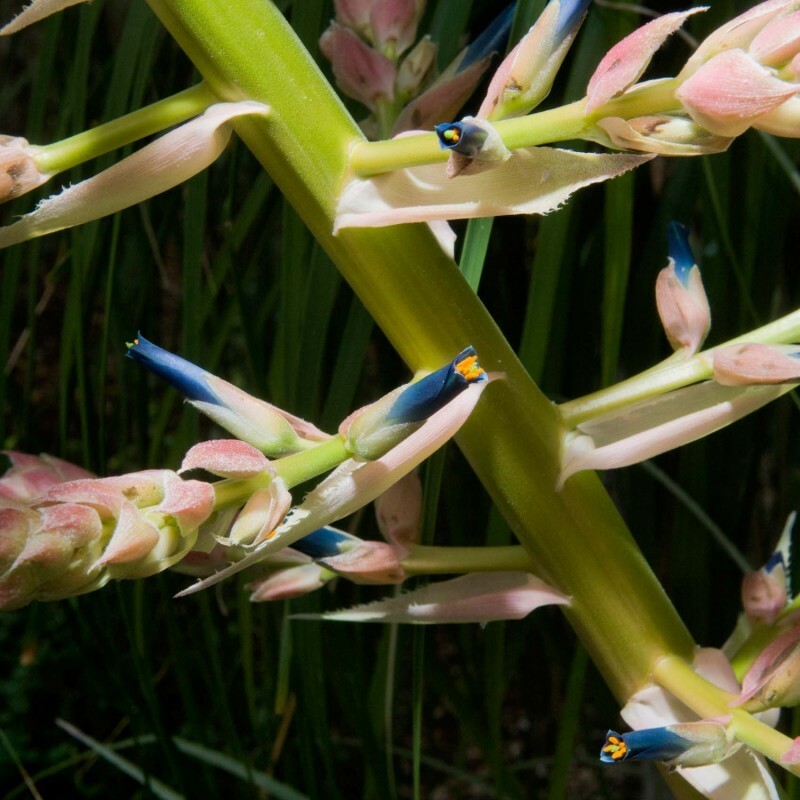 The long tubular flowers of aloes are adapted for pollination by sunbirds, the African equivalent of our hummingbirds. The sap of aloe vera is used widely in cosmetics and to treat burns. 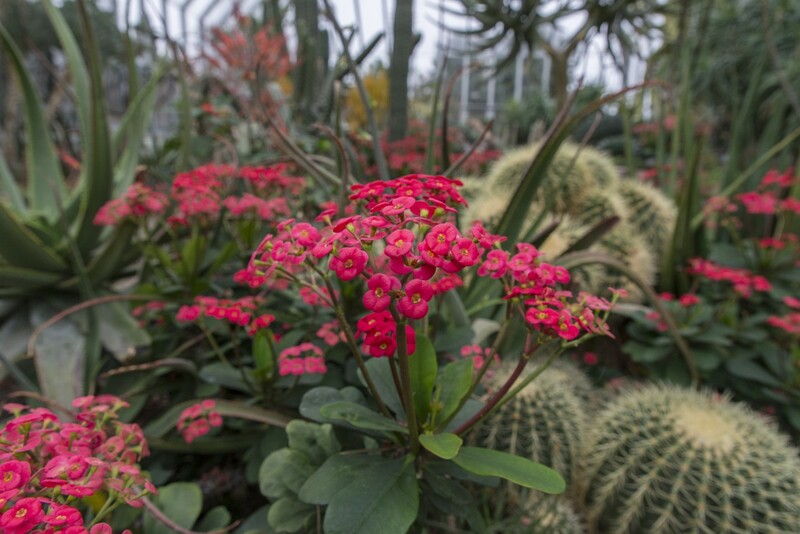 Our 35 different species of euphorbias are also spectacular during this time period. Look for geographic forms and cultivars of Euphorbia milii as well as the spectacular Masai spurge (Euphorbia neococcinea). Did you know that poinsettias are also in the genus Euphorbia? About to flower for only the second time in 30 years is turquoise puya (Puya alpestris), a bromeliad native to the high, dry deserts of Chile whose turquoise flowers are irresistible to hummingbirds. Paper flower—What appears to be the “flowers” of Bougainvillea ‘Barbara Karst’ and ‘Singapore White’ are actually colorful bracts surrounding the small, white flowers. 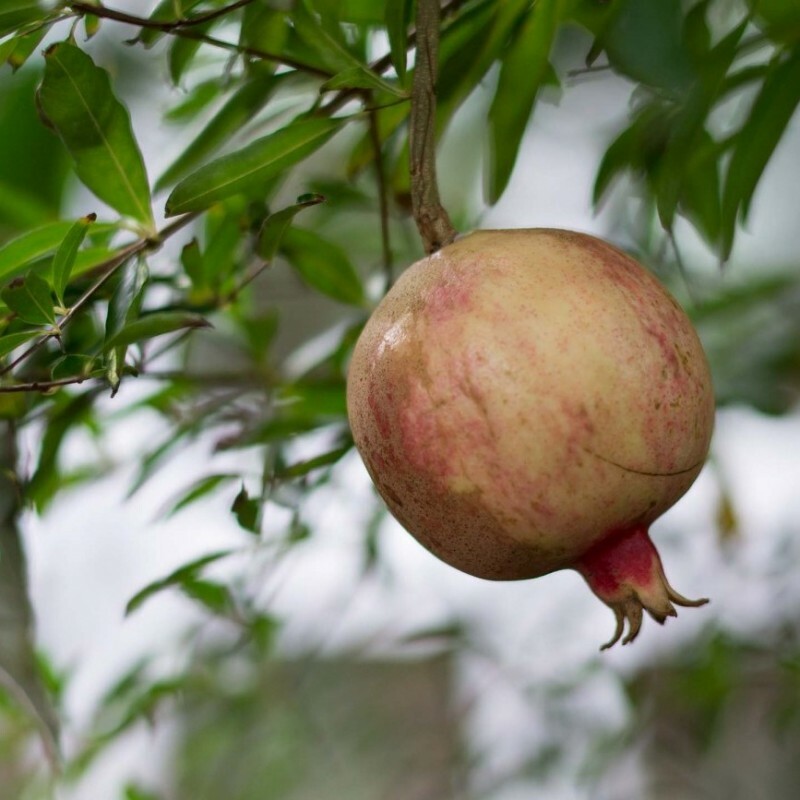 Dwarf pomegranate (Punica granatum ‘Nana’)—Pomegranates are native to the Middle East and are part of the Biblical Plants collection in the Semitropical Greenhouse. Calamondin orange (× Citrofortunella mitis)—This decorative, small orange is too bitter to be eaten. Ponderosa lemon (Citrus × ponderosa)—Ponderosa lemons are the largest in the world. “Alice” the titan arum (Amorphophallus titanum) with her magnificent orange fruiting spike. (The fruiting stage does not produce an odor.) The fruits will mature over the next two months to a deep red. In the wilds of Sumatra, ripe fruits are eaten by the rhinocerous hornbill, which spread the seeds. 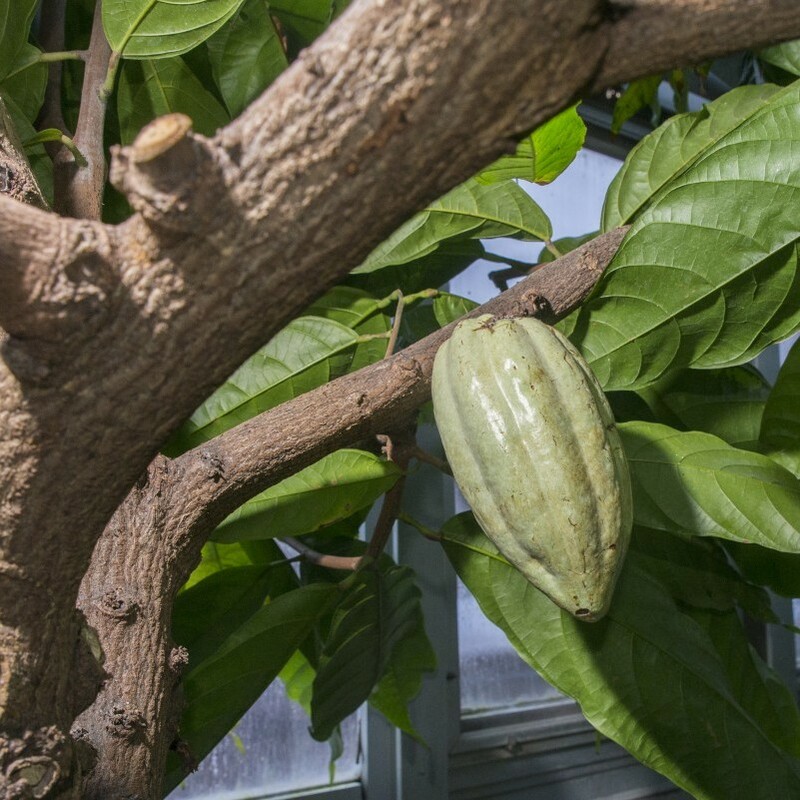 Cacao (Theobroma cacao)—the pods from this plant are used to make chocolate. 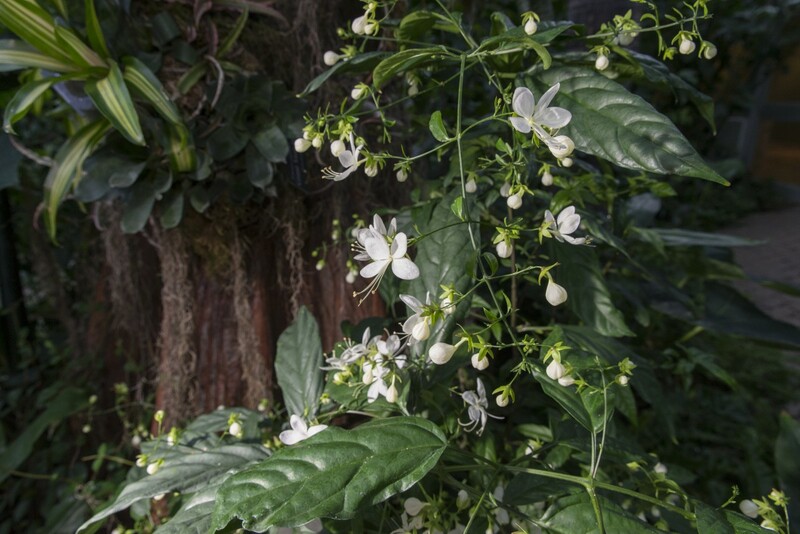 Nodding clerodendrum (Clerodendrum nutans) is among the first of this genus of winter-flowering shrubs and vines to be covered in showy flowers. 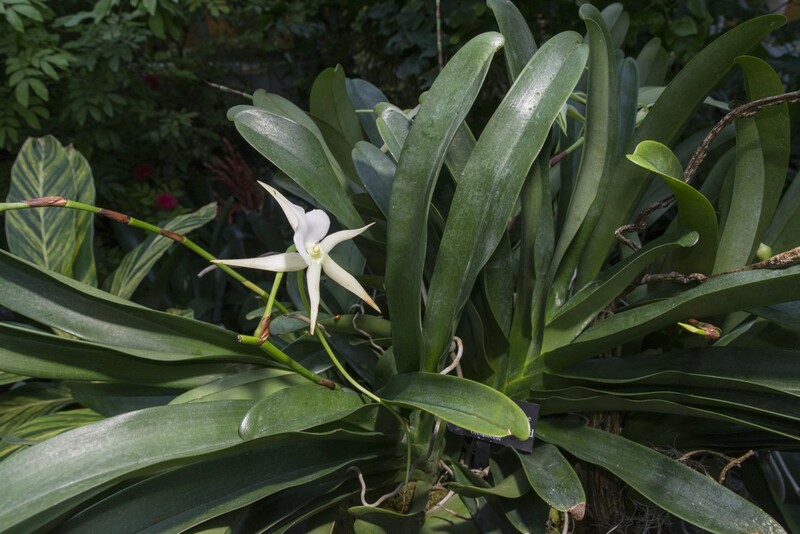 The elegant white Angraecum Memoria Mark Aldridge orchids with their long nectar tubes signal the start of orchid flowering season. 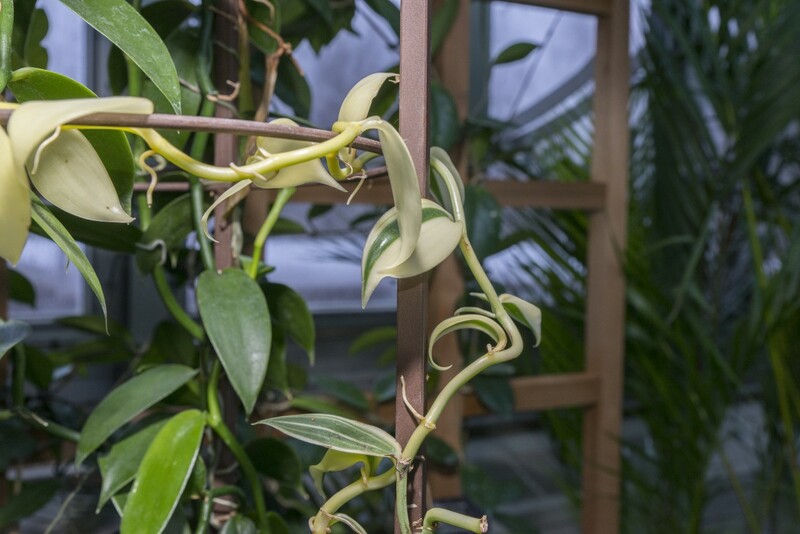 Please note: The Greenhouses and adjacent galleries will have limited access January 25 – February 7; from February 8 – 12, they will be closed in preparation for the Orchid Show, opening February 13, 2016. From February 13 – March 13, the Greenhouses will be open to Orchid Show ticketed visitors only. Love the Ponderosa lemon. I have one grown from a seedling of the Oak Park Conservatory’s tree. It goes out in the garden in summer, and lives in the basement under grow lights in winter. This year it made flower buds, but nearly all have dried up and dropped off before opening. I’m assuming the culprit is low humidity, and I have been misting them daily, which hasn’t helped. Any ideas? You didn’t mention if the flower buds dried up and dropped while the plant was growing indoors or outside. 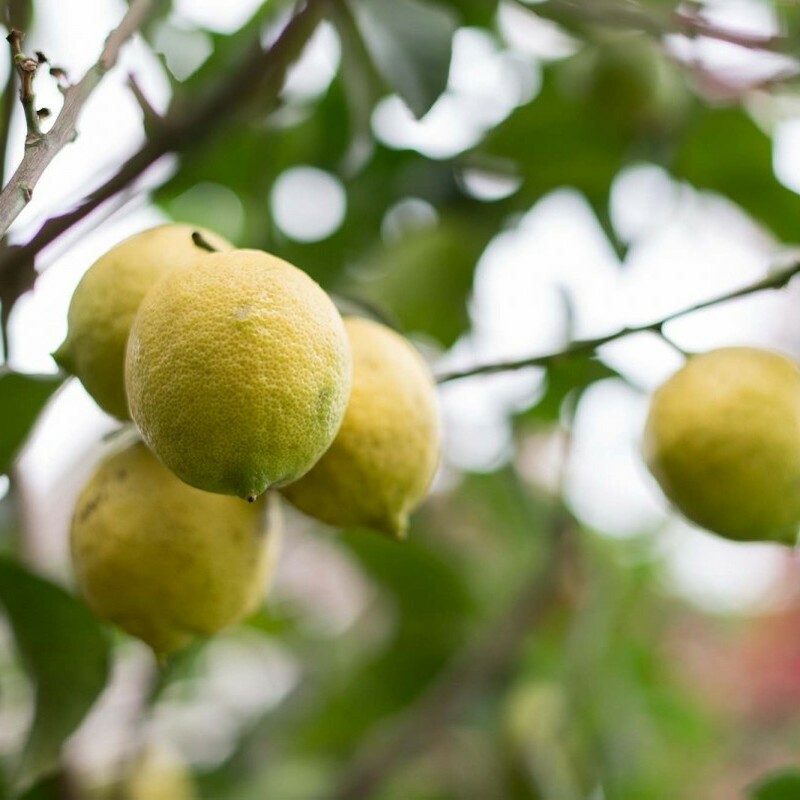 There are a number of reasons why the flowers buds of your lemon tree fail to open when grown indoors. Sometimes the culprit is inadequate light as direct sun is generally needed for good flowering. 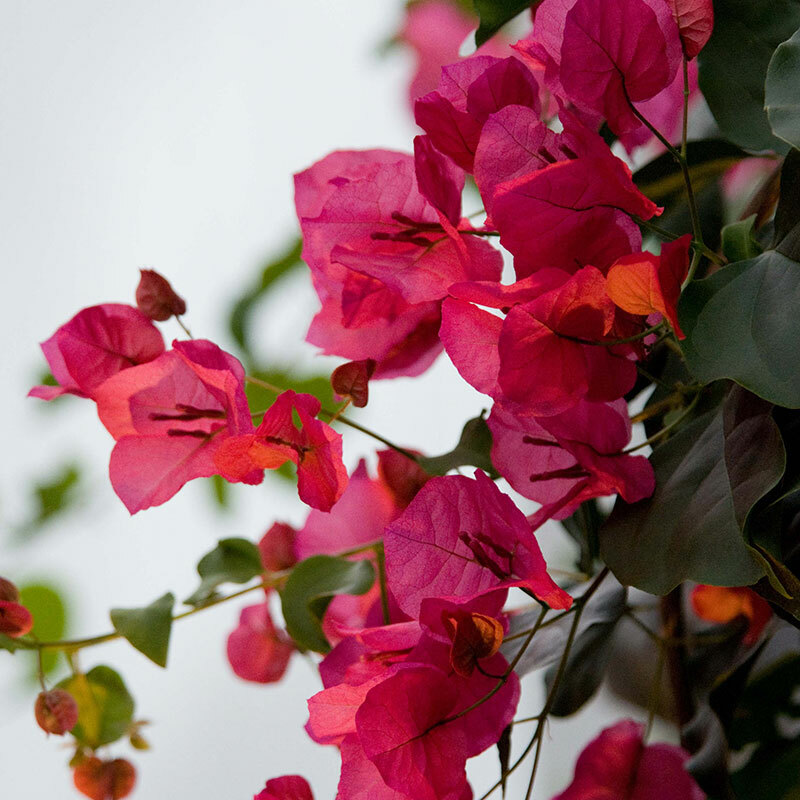 You can achieve success with artificial lights; however, flowering is best achieved outdoors in the summer months. Inconsistent or too little water can also cause flower bud drop. Indoors, you can allow the top inch of soil to dry between watering. Outdoors, you will want to keep the soil lightly moist at all times. And, of course, the plant will appreciate misting twice a week. Last but certainly not least, you will want to inspect all parts of the plant carefully for the presence of mites or other insects. Our Plant Information Service will be more than glad to examine it microscopically if you’d like to bring us a sample. If you have more questions, please feel free to contact them directly at plantinfo@chicagobotanic.org or (847) 835-0972.